It is rainy and grey and I don’t want to make the trek (50 minutes) down to school for one class. Blegh. But, it’s my man’s 22nd birthday and I will meet up with him downtown. So all is good. And since it’s warm, I can wear my new(ish) Gore-Tex jacket. I ran out of one colour of the log cabin (a random ball of blue with a bit of red from long ago) as I was binding off that section. So I subbed in some other blue (which was leftover, not enough to do a section) for the bind off. Realization: the bind off yarn doesn’t show from the right side! Good good. I still can’t decide between mitred squares and mini log cabins for the STR blanket. Not that I’m going to be starting it anytime soon. Did I mention that we got in a shipment of Socks that Rock lightweight at lettuce knit? You can call Denny today and do mail order! *ducks* Call or go soon, it’s going be sold out fast! After more than a week of the elimination diet, my skin is finally starting to look better. Just starting, mind you – definitely not spectaular results yet. But I guess it’s giving me a bit of encouragement when I’m really, really starting to get tired of this. I want EVERYTHING. Even things I didn’t eat much before, like French toast. Mmmmmm, french toast. And eggs. And fake bacon. As soon as my yarn arrives I’m going to start the cabled little jacket thing (#15, I think it is?) from the latest Vogue. In cream Andean Silk – that thing calls for a LOT of yarn – 9 skeins of Cascade 220 for a 35″ (which, by the way, is the biggest size. Bummer, man). So I ordered 20 balls. I also bought some dupioni silk from Fabricland, way on sale – 30% off $18.99/m. I bought both a chocolate brown and a nice rose-y pink-y colour for holiday skirts. So this year I won’t just be wearing my usual red top and black pants! Cream sweater and brown skirt = awesome. I’m going to just jump into a skirt pattern without making a muslin, but I have used the pattern before and hey, I know how to make a skirt. I’m hoping for fairly long but I only bought 2 m, so I might have to go back and get some more. Maybe get megan to serge the insides of the seams for me (I usually just zigzag ’em but since she’s got the fancy serger it would look super!). Well, that got long eh? I’ve got 2 big papers (10 and 20 pages), a poster session, and two exams before I’m free of school for the rest of the month. I’m out on the 14th. So a lot of this will have to wait until then! 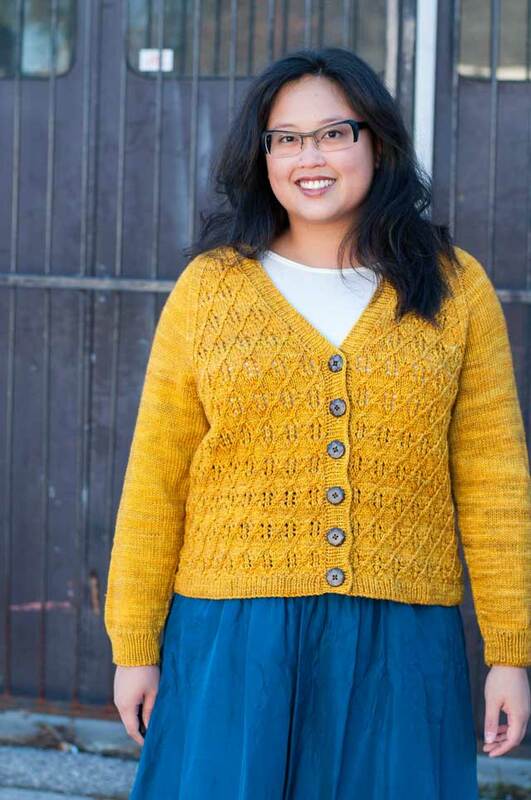 I am making the cabled jacket from vogue too… so far I have only finished one front, but I’ve already found a couple of errors that are not listed on the errata page for the magazine. I don’t have my copy of the magazine with me right now, so I’m sorry that these will be a little vague. There is one line where the k4(8,12) instruction at the beginning is missing (this is obvious). The stitch count for the front immediately after the last neck decrease is off (it should be one less that what is written) and all of the stitch counts after that are correspondingly off. Also, the top of the fronts as written looks really ugly (from the row where you p2tog a bunch of times) – i modified this to match the decreases to the rib pattern. About yarn requirements, it took me only about 1.5 balls of elann highland wool (i think this is about 150 m) for one of the fronts for the 35″ size, so the yarn requirements may be possibly overstated? i have 16 balls of highland wool, but I am not planning to make the belt. Excellent choice on the #15. You will be so chic! I need to branch out from the red and black this year, too. The strangest thing happened. Just a couple of days after I read your post about the diet to determine the trigger for your eczema I woke one morning with a red eczematous rash about 4 inches in diameter on my arm. I have never had this happen before. I just looked at it in amazement. Can reading about eczema cause eczema?! (just kidding) It cleared up and has not come back. whew. I got a miniscule taste of what you must go through. I am glad that your skin is healing and I hope you find the cause(s) soon. Years ago (in the late 60s), when my sister was in college, she developed an eczema right in the middle of her chest. She itched until her flannel nightgown was thread-bare in that area. The itching continued through an early marriage to a young man who got his “jollies” from keeping her frustrated for one reason or another. Once she finished school and got a divorce, her eczema went away and has never returned. Seems to me that “stress” may play a big part in it! Good luck! I’m new to your blog. Love all of your sweaters! I feel sort of weird commenting when I haven’t before, but I’ve finished a highly modified version of the bell-sleeved cable sweater and should have a post about my changes by the weekend. I like it much better without the collar but the length doesn’t quite work on me with the bottom edging I put on and probably would have been worse if I’d followed the pattern. I really look forward to your version, though!